When asked how he could play the saxophone like that, Charlie “Bird” Parker said, “First you learn your instrument really well, then you forget all that [stuff] and wail!” You have to be able to do something before you can do nothing. God cannot create skill. Inspiration comes best with perspiration. Make up your mind what you want to do, then let go and let God lead you there. 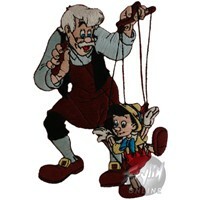 Doing God’s Will is more of a dance than a puppet show. God seeks partners, not slaves, or even subjects. God is a creative and loving being, not a punishing ruler. Beware the person who says he only does what God tells him to do, especially when the instructions he’s getting are for you! Run from that person and don’t look back. Free Will – What’s Up With That? The INNER VOICE offers instructions and suggestions, never commands or threatens. To listen for Still Small Voice within our soul; the Higher Self guides us to Self Fulfillment. take action on those inner gentle nudgings; then greater works shall be offered us. To get up in the morning and keep to our daily disciplines : to our meditation times, to a proper diet and physical exercise program, to having right associations, and to living a conscious productive and creative life; these are the gifts of The Higher Self. The Yoke of Christ is Light, and the Great Work is really Child’s Play!